Three weeks after former Baylor football coach Art Briles wrote the public a mewling letter promising that he’s really a stand-up guy, he’s continuing on his quest to repair his image and lock down a new coaching job. 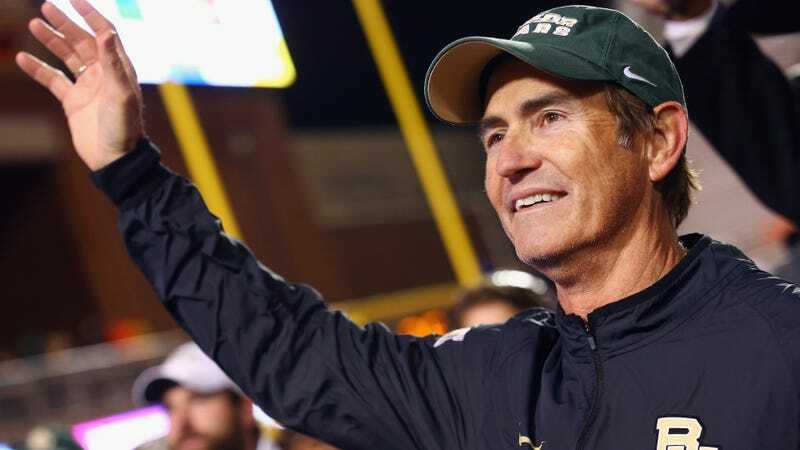 Briles was a guest speaker at yesterday’s Birmingham Football Coaching Clinic, saying that he wants to stay in football for another decade and that he’s happy to be “open and free” right now. It presumably also affected the women who suffered an alleged 52 rapes at the hands of football players over the course of four years, but whatever. Thank God Briles is here to selflessly protect the office personnel, the strength staff and the other coaches. Always putting others before himself, truly. Lawsuit: Text Messages Show How Baylor Coaches Turned Football Program Into Disciplinary "Black Hole"